As reports show over a million car owners have given up their vehicles due to rising fuel costs, Motorpoint has found a way to help its customers save pounds on petrol by offering one of their most eco-friendly cars yet. One of the best ways customers can save money is to find a car offering high fuel economy so Motorpoint has sought out the Hyundai which can do over 60mpg. The Hyundai also boasts energy eco tyres which will help stretch the pounds even further and a five year warranty to reassure our customers. 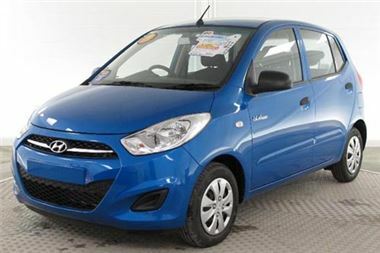 The five door 1.0 Hyundai i10 Blue hatchback is available from Motorpoint for £7,299 – a saving of £2,179 on the official UK 'list price'. Not only does the Hyundai offer great fuel economy, it also has low CO2 emissions of 99 g/km meaning that road tax is free of charge and the car is London Congestion Charge exempt. The car also comes equipped with air conditioning, metallic paint and a black cloth interior. Fortunately, this is not the only Hyundai i10 Motorpoint has in stock as there are also 1.2 litre models available for the same price or less offering customers considerable savings (2011 models are £20 a year to tax). Each of the Hyundais come with a five year warranty and their efficiency will help cut spending on petrol, ensuring peace of mind. Motorpoint is one of the UK’s leading car supermarket. Motorpoint sold 44,000 cars and commercial vehicles in 2010. Motorpoint is currently listed at number 68 in the Sunday Times Top Track 250. For more information on Motorpoint visit www.motorpoint.co.uk.